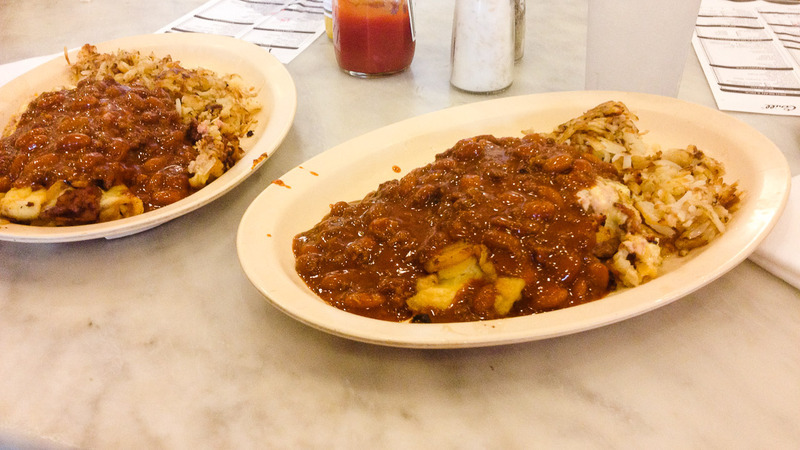 Our first introduction to New Orleans was The Camellia Grill. It's a white neoclassical free-standing building that sits at the end of South Carrollton Avenue near the Mississippi River. 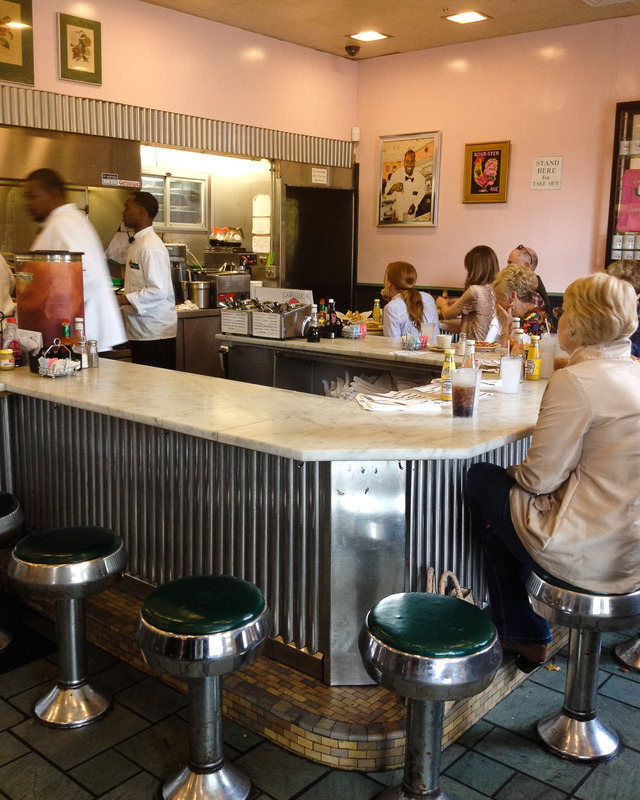 It looks more like a miniature version of the White House than a diner… that is, until you walk in. The only seating is on about twenty diner stools at a counter that is shaped like a really blocky W. The walls are painted a gentle pink. Four or five waiters/short-order cooks in white shirts stand behind the counter, flipping burgers, taking orders and fist-bumping customers. We find a pair of stools and a big ole man gruffly hands us a menu. I'd heard that NOLA natives were known to be not so welcoming to tourists; John had his giant camera in tow. Perhaps he'd already written us off as touristy douche bags? The suggestion said that their omelettes were amazing, so we went balls-to-the-wall and got the "Chef's Special Omelette": turkey, bacon, ham, french fries, onions, American and Swiss cheese topped with chili. RIDICULOUS, I know. Oh, and a side of hash browns to round out this calorie-fest. Thank the lord we decided to split it; out came two giant plates of mega omelette hiding under a mound of chili hot off the griddle. How one single person could eat all this is beyond me. Despite the massive amount of ingredients, this omelette was fantastic in a will-cure-the-worst-hangover-of-your-life kind of way. I ate every bite. And then regretted every bite for the next five hours. So, so full. This is one 'Chef's Special Omelette' split onto two plates. Yeah. We got up to leave and thanked Mr. Grumpy (our waiter man), who to our surprise, extended his arm for a coveted fist-bump. We exchanged bumps with big ole smiles and he said "Y'all come back now!". Oh Mr. Grumpy, we will be back. But next time we'll be sure to have a bigger appetite and a worse hangover. Special thanks to Rebecca R. (who suggested eat an omelette.) for making this blog post possible!